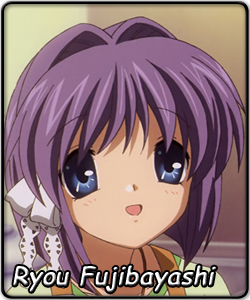 Ryou is the younger twin sister of Kyou and she is the class representative in Tomoya's class. Timid and reserved, she has a crush on Tomoya, often blushing and stumbling for words when trying to talk to him. Kyou is very protective of her and actively tries to set up situations for Ryou, such as inviting Tomoya to have lunch with them and then randomly leaving, conveniently leaving them alone. She is very friendly, willingly helping Tomoya with whatever he asks for, whether it be something sincere or silly. Once, she pretended to be Tomoya's female counterpart, telling Fuko the famous line, "It falls off every now and then." She can be rather gullible at times, easily swayed by the mood. One of her favorite hobbies is fortune telling, and she sometimes use tarot cards to try and persuade her reluctant classmates to watch her. Even though her predictions are frequently off the work, she never stops trying, persistent until the very end, with fortune telling and other things.